Mobile computing is the way of the world in business today. But you don’t have to settle for low-performance graphics, reduced processing speed, and much fewer capabilities than your on-site workstations and servers just because you are working remotely. That’s because NextComputing portable systems allow you to take all of those capabilities with you — on the road, at home, wherever you need it. 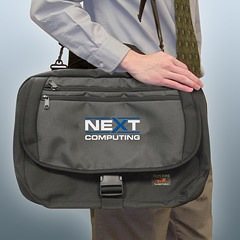 NextComputing specializes in making high-performance computing portable, so that you don’t have to compromise on performance and features just because you’re away from the office. By using our unique architecture we can pack the same enterprise-class computing you expect in a server or workstation into a convenient, pack-and-go system that’s ready to go where you go.